Police shooting award "Deutsche Polizeimeisterschaften in Frankfurt/Oder 1939". Thick copal construction, complited with soldered on closing device. Very good condition no repairs, no damage. Very rare award and hard to find. 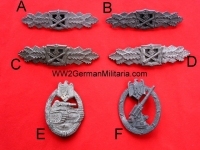 Grouping to Unteroffizier Hans Zeller consisting of his Short-range Day Fighter Clasp in Gold with document, and Luftwaffe version of the "Afrika" cuff title, also with attendant document, dated 1942 and 1943 respectively. Grouping to Unteroffizier Johann Zeller (brother of the above) consisting of his Radio Operator/Air Gunner badge (Deumer) with award document dated 1942, and his Iron Cross its Class with document dated 1942. 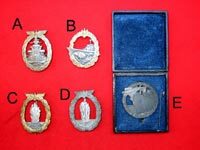 More rare Infantry badge in Bronze then in Silver. The badge awarded to Panzer Grenadiers Troops. The solid reverse of the badge has a soldered hinge a thin round vertical pin and a catch all intact. Unused examples with excellent details. Rare maker with manufacturer's initials code "FZS", indicating manufacture by FRITZ ZIMERMANN STUTTGART. Marked: "Fec.Otto Placzek Berlin Ausf.Schwerin Berlin"
Nicely detailed alloy construction clasp with a silver washed finish. The clasp has a magnetic sheet metal backing plate. The reverse has horizontal pin and a soldered catch. Nicely detailed injection molded alloy construction clasp with a bronze washed finish. The bronze finish remains approximately 70% intact, with the base metal (zinc). The reverse is marked (hard to read) with manufacturer's initials, "F & B L", indicating manufacture by Funcke & Brüninghaus, Lüdenscheid. The reverse is marked with manufacturer's initials, "F & B L", indicating manufacture by Funcke & Brüninghaus, Lüdenscheid. Die struck alloy construction solid backed, badge with a bronze washed finish. Complete pin and catch intact. Die struck zinc construction badge. The reverse vertical pin and a catch intact. 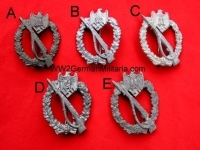 Die stamped, hollow backed, alloy construction badge. Excellent badge with issue envelope. Die struck alloy construction hollow backed, badge with a bronze washed finish. Die struck alloy construction, partially scooped backed, badge with a bronze washed finish. The reverse is well marked with manufacturer's initials "AS", indicating manufacture by A. D. Schwerdt, Stuttgart. Die struck, solid backed, zinc award. The reverse is well marked with manufacturer's numerical code, "30", indicating manufacture by Hauptmünzamt, Wien. Die struck alloy construction hollow backed, badge with a silver washed finish. Die struck alloy construction solid backed, badge with a silver washed finish. 1939 pattern, stamped hollow backed award with a black wash.
1939 pattern, stamped magnetic sheet metal construction, hollow backed award with a black wash. The reverse is well marked with manufacturer’s LDO code "65 indicating manufacture by Klein & Quenzer Idar/Oberstein. Excellent condition and black wash on the badge. Die struck construction badges with a silver wash. The solid reverse of the badges has a soldered hinge a thin round vertical pin and a catch all intact. B Marked with manufacturer’s numerical code "4" indicating manufacture by Steinhauer & Lück of Lüdenscheid. C Hard maker to find.. Marked with manufacturer’s initials code GWL Gebruder Wegerhoff of Ludenscheid. D Marked with manufacturer's initials code "f.o. ", indicating manufacture by Friedrich Orth of Wien. Die struck construction badge with a silver wash. Marked with manufacturer's initials code M.K.D. Shows heavy ware but still nice clean example.